To manage increasing public nuclear safety awareness, China said it will become more transparent in monitoring nuclear power plants. According to Mr. Zhao Yongkang, deputy director of the nuclear and radiation safety division under the Ministry of Environmental Protection, this will include, starting this year, the online publishing of environmental impact assessments and safety assessment reports of all of China’s nuclear power plants. Moreover, China is also planning legislation on nuclear safety. China’s pursuit of nuclear power comes from the need of energy security. However, its recent “go west” strategy will expose itself in front of the risk of water security. 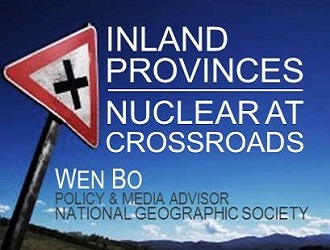 Check out Wen Bo’s view on China’s inland nuclear power projects. In the hopes of becoming China’s first inland nuclear power project, Pengze Nuclear Power Project (owned by China Power Investment Group) in Jiangxi Province has begun some pre-construction work. However, the project has met joint resistance from the government and residents of the downstream Wangjiang prefecture in neighboring Anhui Province. Wangjiang government publically accused Pengze Project of falsifying its EIA report. 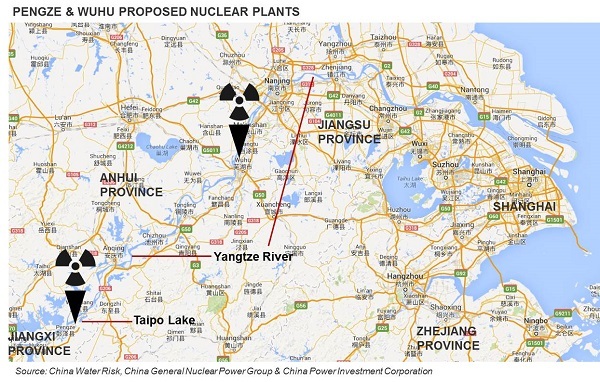 Such confrontation shows Wangjiang’s deep concern over the close proximity of a nuclear power plant. Nuclear power requires large volumes of water for cooling. Adequate water supply is the key factor for identifying potential plant sites. Pengze was chosen due to its adjacency to the Taipo Lake and the Yangtze River. However, unlike inland nuclear project areas in the United States which often have few people downstream, China is relatively densely populated. China’s vast river network and dense population distribution mean inland nuclear power stations have many inherent risks. Although the Pengze project in Jiangxi was opposed by Anhui province, Anhui itself has also started developing its own nuclear power projects. Wuhu Project is the first of them. 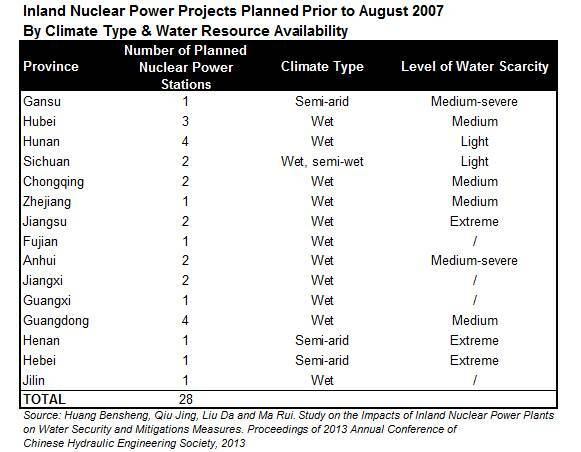 It is being developed by China General Nuclear Power Group, who own several nuclear projects (see table below), and is located in Fanchang County along the Yangtze River, upstream of Wuhu City. You can imagine the worry of the people in Wuhu with regards to the nuclear power safety and risk of radiation poisoning. Electricity generated by the Wuhu project will be delivered to the Eastern China Power Grid. In addition to satisfying its own needs, it will be exported to Zhejiang, Jiangsu and Shanghai. Huge investment and construction costs will inevitably be reflected in the electricity price. It is expected that Anhui will either become an inland nuclear power exporting province or face rising energy costs, especially in the southern part, including Wuhu city. If not, the investment costs in the Wuhu project will not be able to be recovered and thereby might become burden of taxpayers and the provincial government. Prior to the Fukushima Nuclear Disaster, 28 inland nuclear power projects (including previously mentioned Pengze) with 59 pre-selected plant sites were submitted by provincial governments to Beijing (pre-August 2007)1. These projects were classified according to the abundance of water resources. If we adopt the climate type classification of wet/dry regions: three projects are in arid and semi-arid regions and 25 projects are in wet and semi-wet regions. However, if we use the level of water scarcity, more than 17 planned projects fall in medium and extremely water-scarce regions. The National Energy Administration’s 2013 Energy Statistical Report states that nuclear power currently accounts for 1.2 percent of China’s domestic energy production. According to the “Nuclear Power Mid to Long-Term Development Plan (2005-2020)” officially approved by the State Council in October 2007, the installed capacity of nuclear power in operation by 2020 is expected to reach 40GW, and its portion of the energy mix will rise to 4 percent. By 2010, a new plan for 2010-2020 was drafted by the National Development & Reform Commission (NDRC), aiming to double the previous 2020 target to 80GW. Due to the controversy raised by this new goal, the plan was not approved by the State Council. However, since information related to this new plan had already been circulated, it raised expectations from the nuclear power industry and also helped its performance on various financing platforms including stock markets. Regardless, after the Fukushima Daiichi Nuclear Disaster in March 2011, approvals for nuclear power projects, including for all pre-project work, were suspended. By October 2012, the State Council approved the “Nuclear Power Safety Plan (2011-2020)” and the “Nuclear Power Mid to Long-Term Development Plan (2011-2020)”. It should be noted that the newly approved plan only allows nuclear power build-up in specifically approved zones along the coast, and does not allow any inland projects during the 12FYP. However, no specific target was given. Subsequently, in January 2013, the State Council’s Energy 12th Five Year Plan (2011-2015) states that the installed capacity of nuclear power in operation by 2015 will reach 40GW and the installed capacity under construction will reach 18GW. According to Mr. Zhang Huazhu, Director of China Nuclear Energy Association, by the end of 2020, China’s installed capacity of existing and under-construction nuclear power may reach 88GW. At present, China’s inland nuclear power stations mainly use “AP1000” units. During normal operation, 4 sets of AP1000 units require a maximum of 498,600m3 of freshwater per day and 156 million m3 per year. By the end of July 2014, China has 19 sets of units in operation, 29 sets of units under construction, and 225 sets of units being planned. To ensure safe operation, the plants will need enough water to cool the reactors for a minimum of 30 days under all circumstances. The increasing number of nuclear power projects will inevitably lead to competition for water between nuclear power plants and other energy producers. 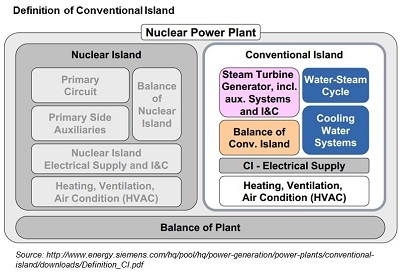 Apart from the largest water use in “conventional islands” (see diagram) of the plant, the workers living within the plant site, as well as the circulation pump shaft seal and nuclear island also require lots of water. In addition, washing and sealing also require water. The water demand during the repair period will also be much higher than that during normal operation period. Moreover, the water reuse rates among China’s nuclear power plants are also very low: for example, the reuse rate of Lingao Phase I is only 3.75 percent. Nuclear power operators rely on a sufficient water supply. However, in China, water resources are managed by the water conservancy and hydropower authorities, who hold a negative view towards nuclear power. The battle between hydropower and nuclear power is fierce, and the competition exists in many areas outside of water including lobbying for preferential policies and central investment funds, and securing bank and capital financing. The Ministry of Water Resources is trying to choke nuclear growth to protect China’s limited water resources while the nuclear power developers are requesting more water allocation for the sake of public safety. In the end, all problems, be they investment losses or threats to the environment, will be ultimately borne by the state and the people. Avoiding Hydro wars – With up to 124GW of planned hydropower on China’s transboundary rivers, no wonder regional geopolitical tensions over water is running high. Debra Tan gives the low down on China’s hydropower expansion, are there other options to avoid sparking hydro wars? 2012 Review & 5 Trends for 2013 – Not sure what happened in 2012? Read our review and find out what our top 5 water trends are for the Year of the Snake. Will we be bogged down or will we slide ahead? Wen Bo, Policy & Media Advisor for National Geographic Society (NGS). He served as the program director for NGS Air and Water Conservation Fund. He started writing articles on China's nuclear issues since 1998 and published in journals from Germany, Holland, USA, Japan and Korea, etc.